Time, temperature and water content during process were recorded. Burn rate of resulting propellants was determined. KNO3: reagent grade "pure for analysis". Moisture content 0.1-0.2%. For samples K160 and K161 it was milled with coffee mill, crystals measured 50 microns to 300 microns (one division on the scale is 14 micron). 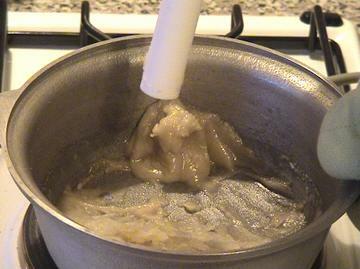 There are also much smaller and larger particles in the mixture. General method: Sorbitol (35.00 g), KNO3 (65.00 g) and water were placed in thick-wall aluminum pan and heated on regulated electrical hotplate. 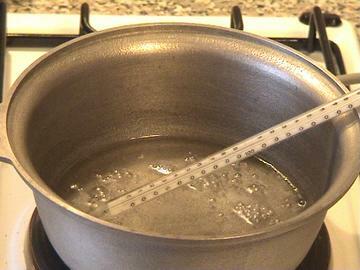 It was determined, that minimum amount of water for dissolving of this mixture at boiling point is about 30 ml. At the moment of complete dissolution timer was started. Sample K152: slow evaporation without stirring. Stage 1: clear solution, smooth boiling. Temperature 110-115° C. Video. 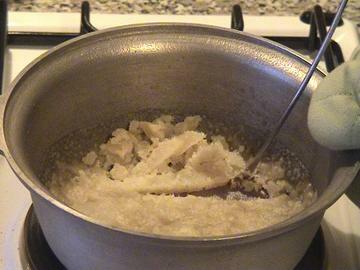 Stage 2: boiling, large bubbles, the most amount of KNO3 crystals deposits at this stage. Temperature 115-125° C. Video. Stage 3: propellant mass is almost motionless, some hissing sound. Temperature 125-140° C. Video. Stage 4: no visible changes, except of slow discoloration. 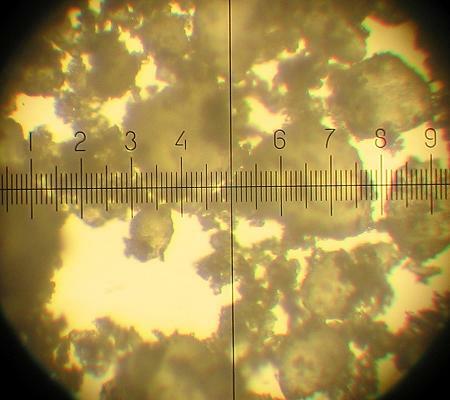 Temperature 140-180° C.
After evaporation of all water sample K152 is crumbly porous semisolid mass. Video. 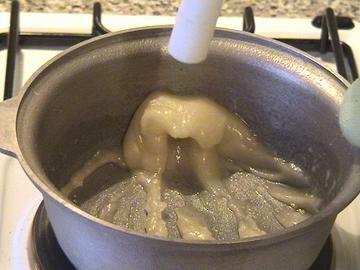 It can be transformed in viscous mass by prolonged tamping. Video. Sample K153: fast evaporation without stirring. 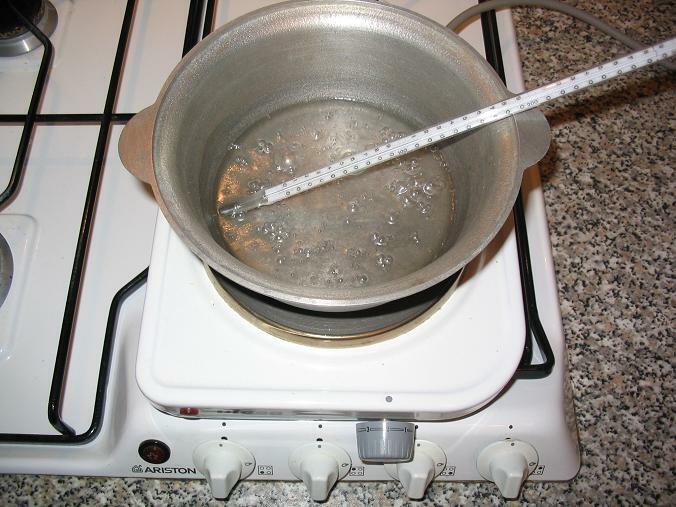 In this case heating to 180° C did not result in complete water evaporation. 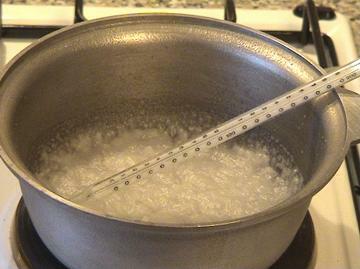 Boiling was more vigorous and so at stage 2 and 3 propellant mass become more porous, then sample 152. I believe this is the reason why upper layers of mass did not reach appropriate temperature. This sample was discarded. Sample K154: slow evaporation with stirring. 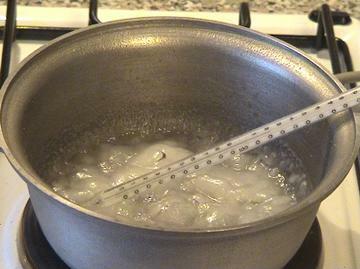 Stirring during all evaporation process allows to evaporate all water more quickly and at lower temperature. 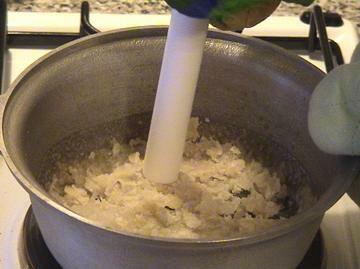 Sample K155: fast evaporation with stirring. 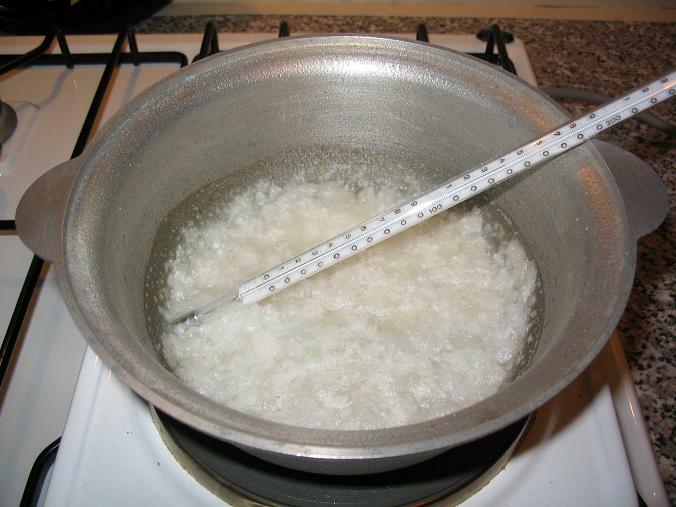 Sample K160: KNSB, prepared by standard melt/cast process at 115-120° C.
Sample K161: KNSB, prepared by melting sorbitol, then addition of KNO3 at 115-120° C.
Resulting propellant has about the same appearance and viscosity as sample K160. All samples become solid during 2 days. Samples K160 and K161 have usual plastic-like glossy surface. 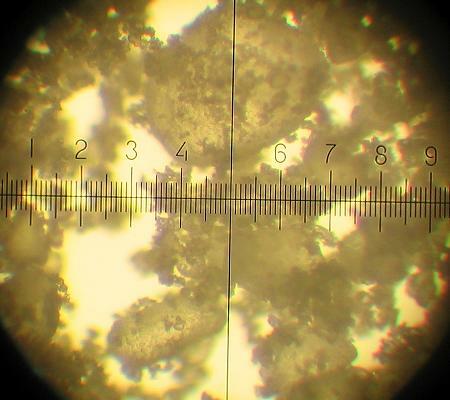 Samples K154, K155 and more so K152 have rough and slightly porous surface. Burn rate was determined by measuring of full length and full burn time of propellant bars 17 mm OD with one layer of paper inhibitor. Two bars of each propellant were prepared. I obtained only one burn rate measurement for sample K154, because second bar ignited on the outer surface due to inhibitor failure. Burn rate data for K155 has large dispersion. So I decided to retest all samples. For this purpose new bars were sawed off from solidified propellant slab, three for each sample. They had rectangular cross-section with dimensions about (5-7)x(12-15) mm. They had paper sticked on one side, it was peeled off. Samples were inhibited by painting with wood lacquer. Burn rate was determined by measuring of full length and full burn time of propellant bars. This set of burn rate data has narrow dispersion, so I believe it is more correct. It is possible, that paper inhibitor facilitated propagation of flame front on the outer surface in the first set. I often see great influence of paper inhibitor on the propellants with very slow burn rate, in the range 0.5-1 mm/s. Obviously, this influence cannot be neglected even for propellants with high burn rate. 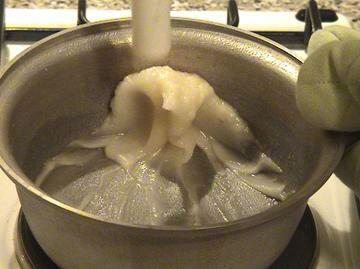 Evaporation without stirring is unsuitable method, because it requires high temperature and leads to caramelization of sorbitol. It is possible, that more uniform heating, for example, in the oven, will give better results. 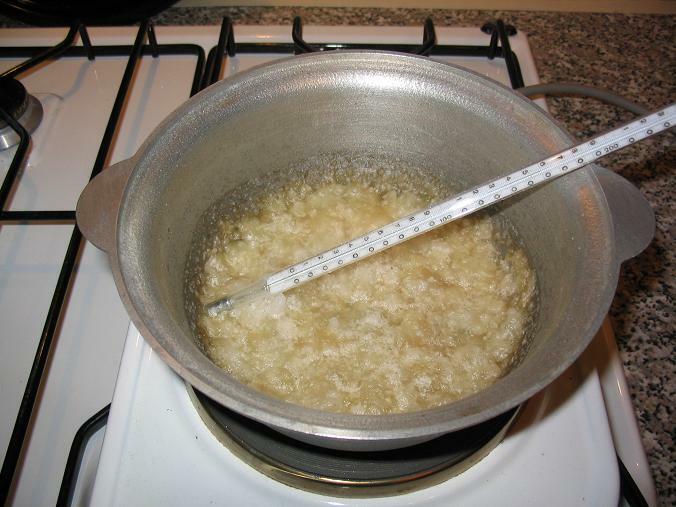 Temperature of the boiling mass can be used as measure of water content when this content is more than about 2-3%. But in the most important area, near the point of complete evaporation, temperature of the propellant cannot be used as definite measure of completeness of water evaporation, at least if we consider safe temperature range not exceeding 160° C. It is possible, that after experimentation with concrete apparatus weighting can be substituted with predetermined time of stirring at predetermined temperature. 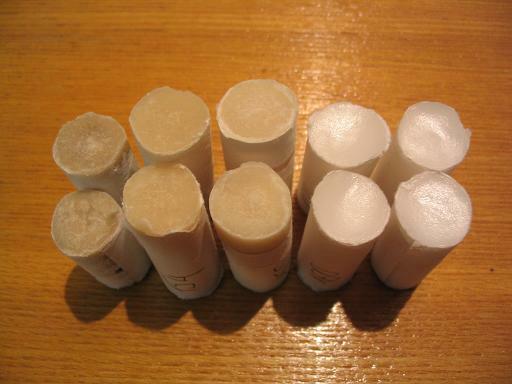 All samples, prepared by evaporation, are much more viscous, than standard KNSB. They are not pourable, just scoopable. Burn rates of evaporated samples are less than melted samples by 0.3-0.4 mm/s. Possible reason is residual water. Weight of the pan with propellant was controlled on the balances with 1 g readability, so propellant may contain up to 0.5% water. If residual water will have so noticeable effect on burn rate in rocket motor, then completeness of water evaporation has to be controlled very precisely. All tested variants of evaporation are much more time- and labor-consuming, than standard melting process. It is possible, that vacuum evaporation will give better results. For preparation of large propellant batches method "melt sorbitol - add KNO3" may be recommended. It is much more safe, because it excludes handling of large quantities of hazardous dry mixture of finely divided KNO3 and sorbitol.